Manager Joe Girardi is fortunate that he is able to do what most managers today can’t do – replace his closer with an established closer. 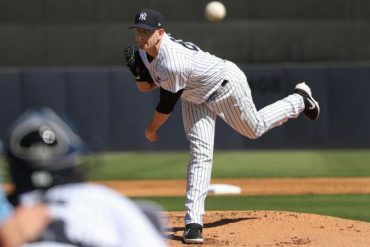 No one is saying Girardi will definitely make a move, most of all him, but he has the option of putting former closer David Robertson back in the 9th inning role. 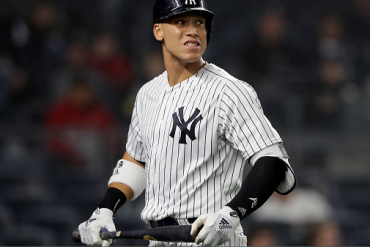 He also has a second option of putting Dellin Betances back in the role he held after the trades of Chapman and Andrew Miller at last year’s trade deadline. 1. Normally these types of countdowns would start at number 5 and work their way down to number 1. But why bother in this case? There’s no suspense. We all know who the top Yankees’ closer of all time is. In fairness it should be noted that, of the names on this list, Rivera is the only closer who pitched in an era when complete games were a thing of the past. 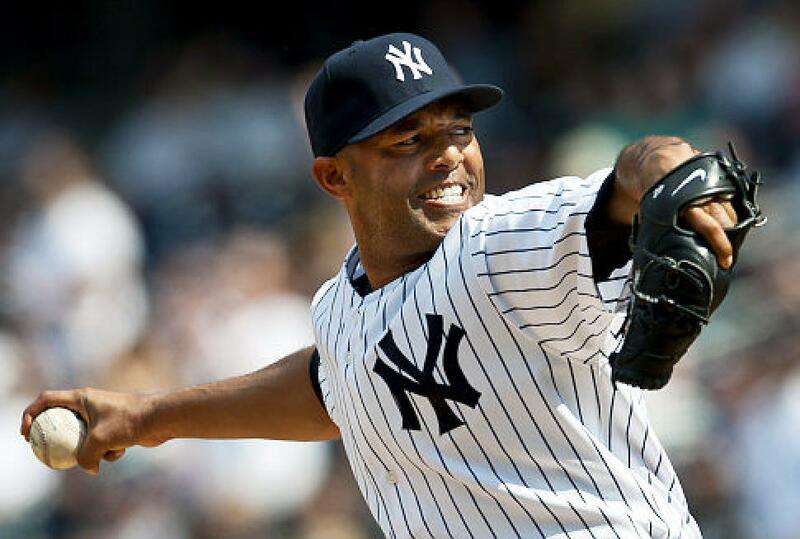 Mariano Rivera and his cut fastball (don’t you just love the way he says “the cutter” with a Panamanian lilt in his voice?) became world-famous in a career that lasted much longer than any team’s closer before or since. By now the story is well known, but for those who haven’t heard, here’s how Rivera became the closer. 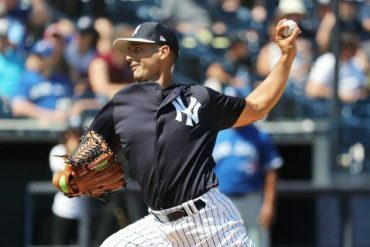 Born destined to be a fisherman in Panama, Rivera played baseball with a cardboard glove and amazingly made his way to the Yankees organization. He was a decent prospect, but not one that got a lot of notice until his fastball started breaking sharply in on left-handed hitters and away from righties. To this day, Rivera stands by his assertion that he did nothing to change the way he throws. The ball just suddenly started to dart away from the plate. Rivera went on to record a Major League-record 652 saves. He twice topped 50 saves in a season and reached the 40+ mark another seven times. He saved 43 games his first year as the full-time closer in 1997 and closed out another 44 in his final season in 2013. The last Major League player to wear number 42 was even better when it came to the postseason. Before becoming the closer, he was the ultimate setup man in 1996. Any opponent that trailed after five innings knew the game was all but over. Rivera would pitch 2-3 innings and closer John Wetteland would come on in the 9th to earn the save. Rivera’s performance was so good in 1996, he finished third in the AL Cy Young Award voting. With confidence they had their present and future closer, the Yankees let Wetteland walk in his free agent year (1997). While Rivera was a great postseason closer, he didn’t start out that way. In Game 4 of the 1997 AL Division Series with Cleveland, he surrendered a game-tying home run to the Indians’ Sandy Alomar. The Tribe won in extra innings and captured Game 5 as well to eliminate the Yankees. However, Rivera didn’t carry his failures over to the next postseason. 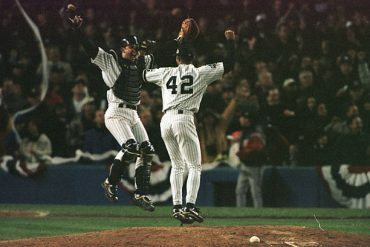 When the Yankees captured the 1998 crown, Rivera appeared in 12 games and tossed 13.1 scoreless innings. In topping Atlanta in 1999 for their second straight title, Rivera earned the Series MVP Award after he held the Braves scoreless in his eight games/12.2 innings pitched. The Yankees made it three straight titles a year later when they beat the Mets in five games. Rivera finally gave up three earned runs in 15.2 postseason innings in his 10 appearances…but there he was on the mound picking up the save in the Series finale. Though he ran into some rough times in the next handful of years, he captured the 2003 ALCS MVP Award and was on the mound for the final out when the Yankees won their last World Series title in 2009. We now return to the normal countdown. 5. Johnny Murphy is the best closer you never heard of. That’s what happens when you play on a team whose roster includes Hall of Fame members Lou Gehrig, Joe DiMaggio, Tony Lazzeri, Bill Dickey, Red Ruffing, Lefty Gomez, Phil Rizzuto, and Joe Gordon. If saves were an official stat during the era that he played (1932, 1934-1943, 1946-1947), Murphy would have led the AL four times. His rookie season of 1940 was split 50/50 between starts (20) and relief appearances (20). Though he started 40 games in his career, he earned his keep with 375 games out of the bullpen. Murphy won 63.7% of games he appeared in and saved 107. He also succeeded without the makeup of the traditional closer that you think of today. His best K/9 IP was 4.4 in 1939. There was also one drawback in his game…walks. In the 1939 season he also averaged 4.1 BB/9 IP. But, he made up for it with less than a hit per inning allowed. The Fordham U product won six World Series rings (1936-1939, 1941, 1943) and was a three-time All-Star. He was 2-0 with four saves and a 1.10 ERA in eight World Series games. 4. When the Yankees acquired Dave Righetti from the Texas Rangers, he was destined to be the next great starter in Major League Baseball. A left-hander with a blazing fastball was perfectly suited for the old Yankee Stadium. “Rags” won the Rookie of the Year Award in 1981 after he made 15 starts in the strike-shortened season. Righetti led the AL that season in K/9 IP (7.6), H/9 IP (6.4) HR/9 IP (0.1) and finished 8-4 with a 2.05 ERA. In his first start after the strike, he struck out nine in six innings of work. At the very least, he was going to be the next great Yankees’ pitcher after Ron Guidry, his teammate at the time. He started for two more seasons, and in 1983 he no-hit the Boston Red Sox. 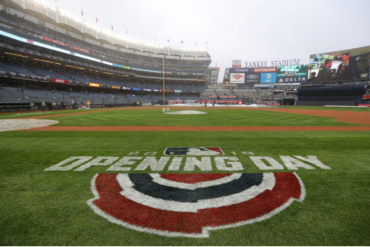 It was the Yankees first no-hitter since Don Larsen‘s perfect game in the 1956 World Series. Righetti once again topped the AL in K/9 IP. While he had good seasons in 1982-1983, he wasn’t as outstanding as everyone realistically or unrealistically hoped he might be. For instance, though he once again led the AL in K/9 IP, control issues plagued him during the season. It resulted in him walking a league-high 108 batters in 183 innings. That being said, he was still just 25-years old when the 1984 season began. Over the Winter, the Yankees decided to make him their closer. It was a decision that was not a popular one among fans. With the Mets’ Dwight Gooden coming off his NL Rookie of the Year Award in 1984 (with 276 strikeouts), perhaps fans wanted to see what Righetti could still do as a starter. For Righetti, the transition looked seamless in going from 217 innings in 1983 to 96.1 the next season. Instead of 31 starts, he came out of the pen in 64 games and he was very good in his new role. Righetti saved 31 games in his first season as the closer and struck out a career-high 8.4 batters/9 IP. Two years later, he set a Major League record when he notched 46 saves. He made the first of two All-Star teams in his career, finished fourth in the AL Cy Young voting, and finished 10th in the AL MVP voting. Righetti, the Giants’ pitching coach since 2000, saved 223 games for the Yankees between 1984 and 1990. He signed as a free agent with San Francisco and saved 24 games for them in 1991, his final season as a closer. Righetti was with the Giants for two more seasons before finishing out his career with the A’s, Blue Jays, and White Sox. He started nine games for Chicago in 1995, his final season in the Big Leagues. The Spring Training 1972 deal that sent Yankees’ infielder Danny Cater to the Red Sox for reliever Sparky Lyle is one of the greatest trades in Yankees’ history. Lyle joined Bobby Murcer, Thurman Munson, Graig Nettles, Roy White, Lou Piniella, and Chris Chambliss in changing the face and competitiveness of the ball club. Lyle had averaged 17 saves over the prior three years in Boston, but closed out an AL-best 35 victories his first year in the Bronx. With his nine victories, Lyle figured in 55.6% of the Yankees’ wins. Lyle’s 1.92 ERA helped him to finish 7th in the AL Cy Young voting and third in the league MVP balloting. A year later, Lyle made his first All-Star team and saved 27 of the Yankees’ 80 wins. In 1976, the Yankees won their first pennant in 12 years. Lyle saved an AL-best 23 games and was once again named to the All-Star team. The 1977 Yankees won it all – the franchise’s first championship since 1962. That season Lyle was the best reliever in the world. He went 13-5 with 23 saves and led the league in appearances with 72. In the postseason, Lyle won Games 4 and 5 of the ALCS and the Yankees rallied to win the best of five series. Lyle won another game in the World Series against the Dodgers that was highlighted by Reggie Jackson‘s three home runs in the sixth and final game of the Series. In all, Lyle allowed two earned runs in 14 dominant postseason innings. Though the postseason has no impact on the voting, Lyle’s regular season earned him the AL Cy Young Award. In doing so, he beat out future Hall of Fame inductees Jim Palmer and Nolan Ryan. Despite the wildly successful year Lyle experienced, principal owner George Steinbrenner wanted more. He signed free agent reliever Goose Gossage to a six-year deal prior to the 1978 season. At 32 years of age, Lyle was baffled – as were most on-lookers. Then they were miffed when Gossage had a terrible start to the season. Lyle appeared in 59 games with nine wins and nine saves in 1978. But, when the game was on the line, it was Gossage coming in for a multiple-inning save instead of Lyle. By the time the playoffs came around, Lyle was a forgotten man. As the Yankees won their second consecutive championship, Lyle made just one postseason appearance. The demise of Lyle’s career prompted Nettles to joke, “He went from Cy Young to Sayonara.” After the season, Lyle was part of a nine-player deal with Texas that brought Righetti to the Yankees. Just as the deal that brought him to the Yankees was one of their best ever, so was the deal that sent him away. 2. Rich “Goose” Gossage’s entry to New York seemed like a luxury after the Cy Young season that Lyle had in 1977. But, the free agent signed a six-year deal that averaged over 600K per season and immediately took Lyle’s job as closer. Gossage began his career as a starter in the Chicago White Sox organization and, in fact, made 29 starts in 1976. He also completed 15 of those starts. It came a year after he collected 26 saves to lead the NL. The Pirates acquired Gossage in the offseason and moved him back to the closer role for the 1977 season. He would never start another game in his professional career. The Pirates sported a monster bullpen with Kent Tekulve and Grant Jackson adding 11 saves and 15 wins between them to the 11 games won and 26 saves by Gossage. The eventual walrus-mustachioed reliever was coming into his own as one of the game’s great intimidators. Steinbrenner recognized that and added the 25-year old to the Yankees pen prior to the 1978 season. Gossage racked up 150 saves in his six years in New York, but things didn’t start out well. With fan-favorite Lyle relegated to a setup role, boos rained down upon Gossage when he lost three times in his first four appearances and blew two saves in his first seven games. But eventually he turned things around and helped the Yankees overcome a 14.5 game deficit to the Red Sox in the AL East. He walked the tightrope in the division tie-breaking one-game playoff in Boston to earn a save that advanced the Yankees to the ALCS. In mid-October, he retired the Dodgers’ Ron Cey in Game 6 of the World Series to give the Yankees back-to-back titles. When Gossage’s contract ran out, he needed a change of scenery and departed for San Diego. He helped the Padres win their first National League pennant and World Series appearance. 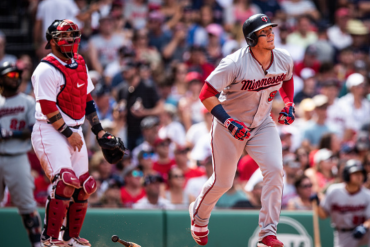 Unfortunately, they ran into a steamroller – the Detroit Tigers – who started the season 35-5. Gossage’s career made stops in Texas, Chicago again (this time with the Cubs), a brief 11-game stint back with the Yankees in 1989, San Francisco, Oakland, and Seattle. He was a nine-time All-Star, including four selections as a Yankee. His time in New York also included four Top-5 finishes in the AL Cy Young voting and three Top-15 finishes in the AL MVP voting. He averaged better than 9 K/9 IP five times, led the AL in saves three times (twice with the Yankees), and won the 1978 Rolaids Relief Award. But nothing could have topped the honor he received in 2008 – induction into the Baseball Hall of Fame after he was named on 85.8% of the Baseball Writer’s Association’s ballots. In 2014, the Yankees honored Gossage with a plaque in Monument Park. An honorable mention has to be given to Luis Arroyo, who in 1961 had one of the greatest seasons ever by a reliever. The native of Puerto Rico appeared in an AL-high 65 games with 15 wins and a league-leading 29 saves. He was instrumental in the Yankees winning the 1961 World Series over Cincinnati. Hey, 2017 Yankees! Get that pen straightened out and Chapman back on course!